Place the water and sea salt in a medium saucepan and bring to a boil. 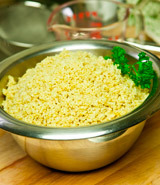 Add the quinoa, cover and simmer on medium-low for 12 to 15 minutes. Remove and place in a serving bowl. Sprinkle Eden Gomasio, Eden Shake, Tekka, Dulse Flakes or Shiso Leaf Powder over each serving as a condiment.